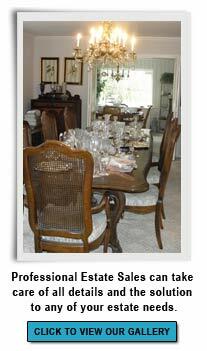 Professional Estate Sales is a full-service estate sale company. Our team is made up of honest, reliable, caring, and enthusiastic individuals who bring over 75 years of combined retail experience. We will guide you through the process from start to finish, happily answering any questions so that you are informed each step of the way. We know first hand how challenging it can be to move from the house one has lived in for decades, or the difficulty in liquidating the estate of a loved one who has recently passed away. Professional Estate Sales can help ease these stressful situations through our many years of managing successful sales. Professional Estate Sales has many letters of recommendations from our satisfied customers including senior retirement centers, attorneys, accountants, and real estate agents. Our company policy is to show kindness, caring, and compassion for the families, along with respect for the property involved, and to make the liquidation of personal property as easy as possible for executors, conservators, and family members. Please call us at 210-826-SOLD (7653) or email us if you would like more details, have specific questions, or get started on scheduling your sale. We look forward to assisting you! 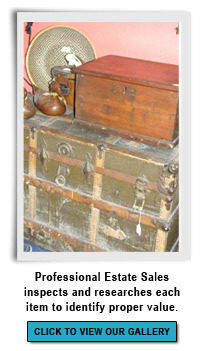 Professional Estate Sales is bonded and insured.